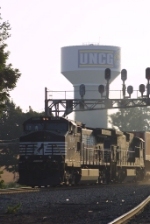 Description: A NS CW40-9 and SD70 await their next assighnment in Chamblee Ga. Description: Getting ready to head down the line at Favor St. Description: Approaching Stroh Rd. grade crossing. Description: Conductor getting back on after flagging for traffic at Stroh Rd. Description: NS 156 from Macon, Augusta and Columbia has just met train 155 between Kannapolis and Adams rolling north on main track no. 1. Description: NS 218 is seen in the early morning sunrise under the signal at Aycock. Description: NS 218 runs south with light units, seen at Hilltop Road. Description: Three NS engines pull a piggyback train west toward Reading. Description: Northbound 154 rolls into Salisbury, passing the Civil War era cemetery south of town. Description: By the afternoon five locomotives have grown to 11 locomotives. Description: 25N sits waiting for a signal at Ford. Description: Lead motor on 25N. Description: UP wings lead a pack of NS thoroughbreds on 351 at Lexington. Description: With clear track south the 630 will soon pour it on to get up to track speed. Description: Heading through South Williamsport now the 630 has a clear run down to Sunbury. Description: About to head under the new Market St bridge H2W follows KH99 north.